Rotary President Charlie Priddle with the coaches and captains of the two teams and the guest speakers. 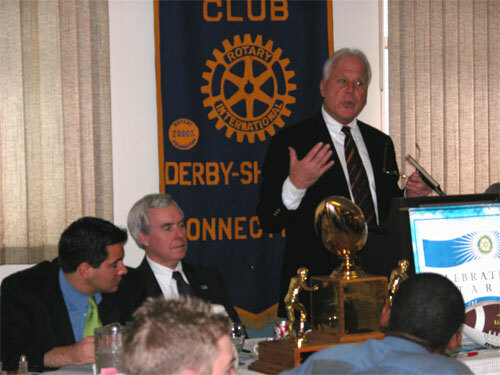 The Derby/Shelton Rotary continued a tradition that dates back more than 75 years when the Club hosted senior football players and cheerleaders from Derby and Shelton High Schools in the annual Thanksgiving Day Football Luncheon on November 23, 2004 at Dave Grant’s Russian Lodge. Nostalgia mixed with the immediacy of the impending game as master of ceremonies Jack Walsh reminded the large audience that the series between the two schools began 100 years ago in 1904. The series is tied with both teams winning 43 games and there have been 7 ties. Walsh mentioned highlights from many of the games gone past while introducing the speakers for the day. In introducing Shelton Superintendent of Schools Leon Sylvester as the alumni speaker from Shelton, he noted that Leon’s father had played in the game 75 years ago, and that Leon had played in the 1954 while Leon’s own son was an outstanding lineman for Shelton High School. Sylvester gave an inspiring talk about the importance of the game and all that it had meant to him through the years. He urged the young people in attendance to learn from their experiences and events like the luncheon to give something back to the community. 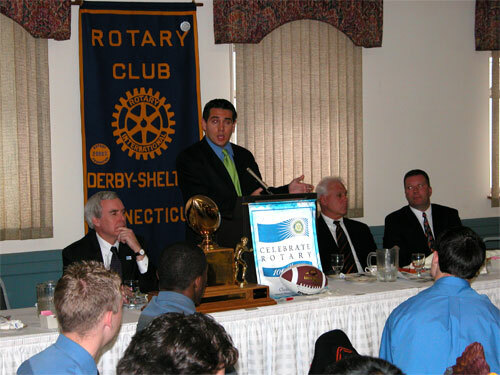 Derby’s alumni speaker J.R. Romano was equally inspiring as he recounted the value of the lessons and values that he learned during his years as a star player at Derby. As with Sylvester, he noted the other members of his family who had played on Derby teams down through the years. He extolled the young people to follow their dreams and not let any obstacles deter them. The perseverance that he had learned at Derby continues to help him today. In addition to the alumni speakers, the coaches from both schools described their seasons and their hopes for the game and introduced their seniors. Senior players and cheerleaders from both teams were also introduced. Rotary President Charie Priddle presented the Rotary Trophy to Coach Jeff Roy and his winning team. The teams met for the 95th edition of the game at Finn Stadium in Shelton with Shelton posting a convincing win. Click here for a story and more pictures.